Rediff.com » News » There can't be a whackier PARTY than this! There can't be a whackier PARTY than this! Students in Scotland’s St Andrews University took part in the annual ‘foam party’ in St Salvador’s Quad over the weekend during the Raisin Day celebrations. The Raisin Day is a traditional carnival where first year students of the university have a wild foam party with their ‘parents’ or seniors. Festivities continue throughout the weekend and culminate in a foam fight on Monday morning. The legend goes that first years used to give sacks of raisins to their seniors as a mark of respect, but how raisins gave way to the crazy foam fight is not clear. Well, it doesn’t really matter, does it? Here are some crazy photographs. Enjoy! Opening photo: Students from St Andrews University participate in the traditional Raisin Day celebrations in St Andrews, Scotland. Students from St Andrews University are covered in foam as they take part in the traditional 'Raisin Weekend' in the historic St Salvator's Quad, in St Andrews, Scotland, on Monday. 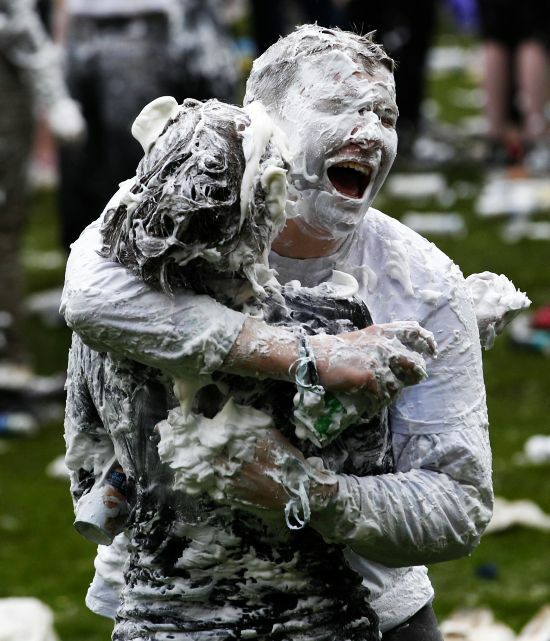 Students from St Andrews University are covered in foam as they take part in the traditional 'Raisin Weekend' in the historic St Salvator's Quad, in St Andrews, Scotland. 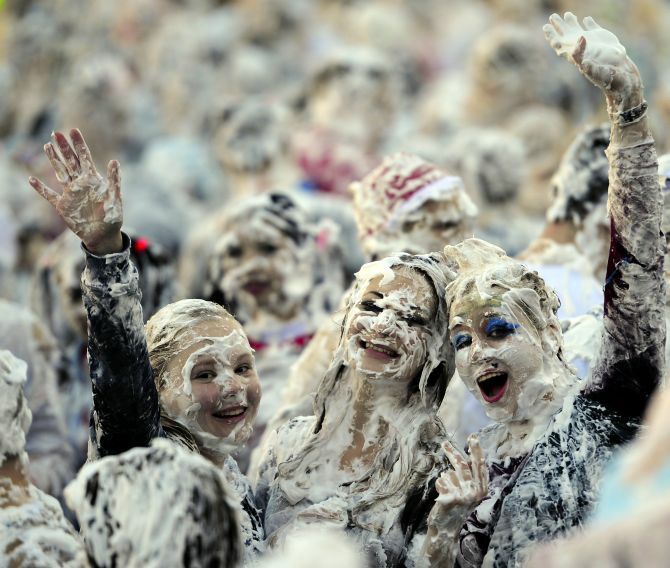 Students from St Andrews University are covered in foam as they take part in the traditional 'Raisin Weekend'. A St Andrews University student sprays foam during the traditional Raisin Monday celebrations in St Andrews, Scotland. 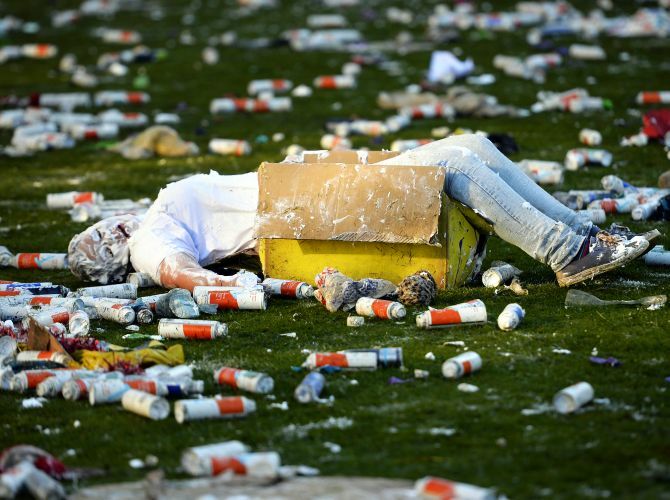 A student from St Andrews University lays, covered in foam, in a cardboard box in the traditional 'Raisin Weekend' in the historic St Salvator's Quad, in St Andrews, Scotland. Students from St Andrews University participate in the traditional Raisin Monday celebrations in St Andrews, Scotland. Students from St Andrews University take part in a foam fight as part of the traditional Raisin Monday celebrations in St Andrews, Scotland. 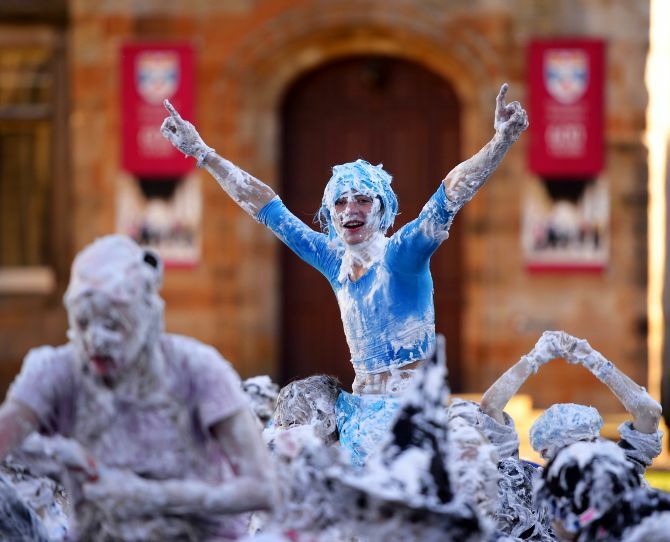 A foam covered student from St Andrews University participates in the traditional Raisin Monday celebrations in St Andrews, Scotland. PHOTOS: At world's largest BEER party... CHEERS! IN PHOTOS: The smashing La Tomatina festival!